There are many healthy options available when choosing a right liquid foundation. Although I'm completely satisfied with kryolan TV paint stick foundation that mean for heavy coverage since liquid formulas are more suitable for everyday use due to its convenient and quick application. I was striving to findout the perfect liquid formula to suit my dry skin which also feel light on skin but I had been confused between maybelline, Revlon and loreal. 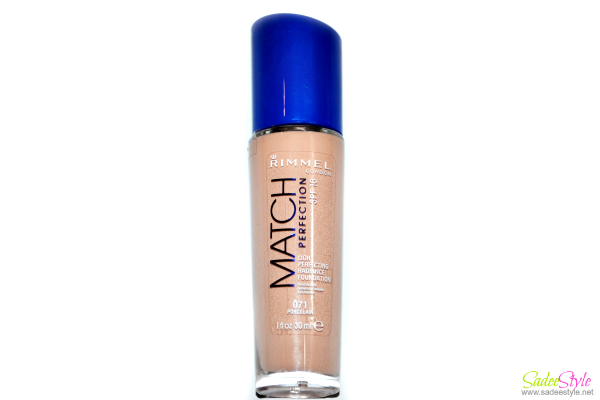 I'm definitly going to try all of them in future but today's pick is Rimmel London Match Perfection foundation. A reason why I've picked rimmel london match perfect foundation over other brands is its most affordable price range. I've picked the porcelian 071 shades which is slighly pinkish shade. It comes in 30ml dispense pump bottle with bright lid on. Rimmel london match perfection is a very right formula in foundation range known perfect for oily skin but I'm so pleased how it surprisingly turned great on my dry skin. It's ultra light SPF formula help skin to feel fresh and hydrated all over the day also protect skin from sun rays. Procelain 071 is a pinkish shade which is good for my fair skin because I'm not very keen of pale foundations because I feel that pink foundations always flatter on me. It's super smooth formula blend easily on skin and provide best results when applying with fingers. Though formula is light and designed for medium coverage but it successfully hide all blemishes without feeling heavy or cracky, only downside is that it bit greasy which definitely can be fixed with compact powder. It provide a clean smooth surface for applying makeup when fix with setting powder. Overall it's one of the best liquid foundations I've ever used so far definitely going to repurchase it. Amazing formula for dry and oily both skintones. Ultra smooth finish which give great coverage. Good choice of shades available to match all skintones. A little bit sticky when use without setting powder. I've ordered online but luckily got the perfect shade. Rimmel london match perfection foundation is one of the highest selling liquid foundations in Pakistan and highly recommended by professionals, I've tried and loved it, it's highly recommended by me for casual or formal use. I'm so happy that its easily available on all local stores across nationwide, I've got mine from mygerrys. You may visit the site for ordering yours, currently mygerry offering great discount offer on all cosmetics range. It was available on mygerry just in 850 PKR when rest shades of foundations are available on much lower price. Thanks for the review! I haven't tried this one but I've tried a lot of other Rimmel foundations and I just love them.